Twinkle the pig is pregnant, but not doing very well. Her diet of fruit and vegetables seems ideal for a mum-to-be, so what can be wrong? 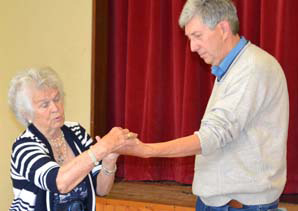 Animal healer Ann Lodygowski, a regular speaker at Slimbridge Dowsing Group, was obviously the person to ask. The worried owner had brought along some of Twinkle’s bristles for Ann to dowse, and she quickly diagnosed a deficiency of Folic Acid and Zinc. She recommended the appropriate source of both for Twinkle, and the relieved owner was thrilled. Ann always delights us with stories of her latest escapades healing horses and other animals, and on 22nd June she came prepared to let us in on some of her secrets, and to reveal some of the ways in which she works. Since much of it is her own intuition, we can’t hope to compete! Having laid out her table of books, flower remedies and even an electrical gadget for finding pain in horses, Ann began her interactive talk, reminding us of the order in which we should ask our questions. She uses checklists and charts of the bone and muscle structures for each animal, and points to every joint, bone or muscle in turn until her pendulum responds. Having found the problem, Ann then dowses her many other checklists to find the remedy, and then to find the correct dose for that particular problem and that particular animal. Ann also gave us some helpful tips - only two drops of homeopathic or flower remedies for cats or they get too much alcohol; no grapes, chocolate or onions for dogs. For humans she recommends Brewers Yeast, which contains Vitamin B5 and Kelp for iodine, both of which can help combat depression. Another worried owner asked for help on Tiglet, a cat which had been having behavioural issues. Ann suspected this was a reaction to a detrimental energy on the staircase in her owners house, which she decided to remove by distant healing, and we are sure this has now gone. Animal healing is just part of what the art and skill of dowsing can achieve, which includes water divining, archaeological dowsing and tracking earth energies too. Our next meeting will be on Thursday 11th July when Kelly Peacey talks about crystals. All welcome.